You are newly engaged and looking for a venue. This is when you first begin to plan out not only the first steps of your wedding planning, but also your life together. This is when you come together and make the power decision to choose a venue. What a big decision! It can seem daunting at first, because this is all new to you. There's an entire world that you didn't know too much about before, even if you've been building your Pinterest board for years.. welcome to the world of weddings! We've notated what to look out for specifically, and we are here to help every step of the way! Even if you live out of state, you're in luck with these venues in Colorado. Destination weddings in the Rocky Mountains are a clever way to surprise your family, friends, and followers back home! 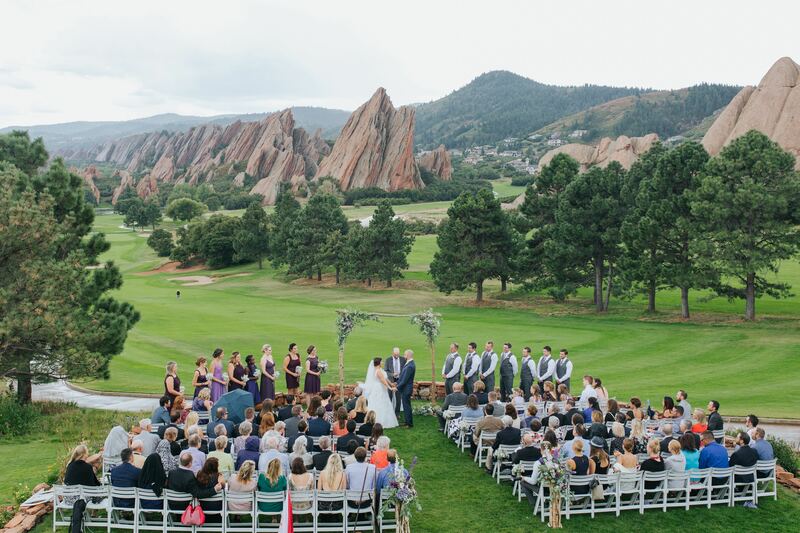 In this mile high state, you'd be surprised how many stunning venues there are! You can find the perfect place nestled into acres of pine trees or sitting right on the front range. It's hard to not to be in awe of getting married in a state like this. What captures most, of course, are the endless mountain ranges. With jaw dropping vistas, your guests won't only be stunned by you in your dress, they'll be taken aback by the location. What's more desirable than an outdoor wedding? We aren't only talking about ceremonies either. Year by year, outdoor wedding receptions get even more popular. With new ideas trending each year, weddings get more and more dreamy. Here are our Top 5 Favorite Venues in the Denver, Colorado area for your wedding day. These venues are meant to perfectly match your style and vision, whether decor is important to you or the staff on hand. What's even better is after your wedding you can use these event center's for birthday parties, corporate parties with many meeting rooms, or live music events at these music venues! This venue is perfect for you if you love charm and elegance packed into 1 venue. They offer 3 different sites: The Gatehouse, The Chandelier Barn, and The Dove House. The Gatehouse can hold up to 350 guests nestled into a large ballroom with a unique stained glass centerpiece, perfect for pictures. The Chandelier Barn is perfect for ceremonies because it hosts 37 chandeliers along with vintage chairs, and yes, it's breathtaking. Housed in a barn, it's very rustic and romantic. The Dove House is for the couple that loves some good history. This mansion sits in the middle of land that is surrounded by 100 year old trees and greenery. It's the perfect spot to get married, especially because their coordinator's are so talented and caring. If you don't mind being surrounded by Colorado's own Red Rocks and luscious grass, then you also wouldn't mind getting married here. This venue is located in Littleton, Colorado. The landscaping is just one reason why brides rave about this venue. They can accommodate 250 guests. They offer their own in house catering with a fully customizable menu for every taste. This venue allows you to host your bachelor/ bachelorette/ wedding party entertainment on the golf course as well. 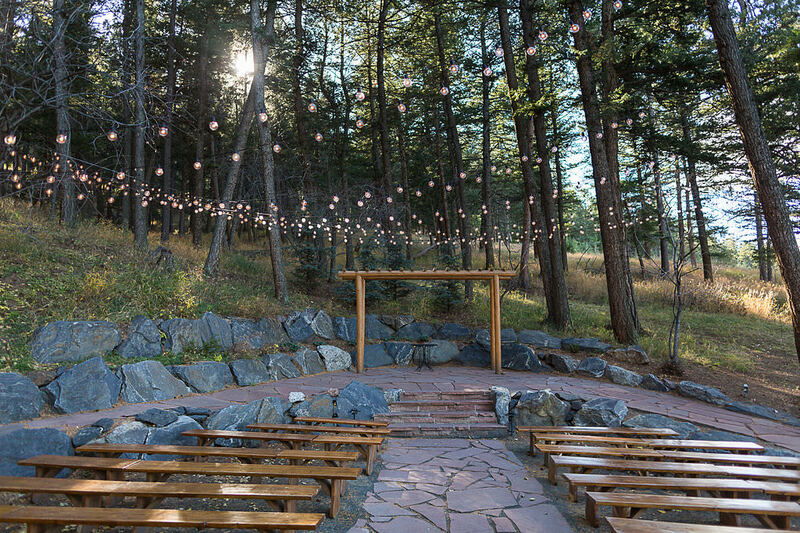 They offer an outside ceremony site, as well as an indoor reception site overlooking Colorado's scenery. He won't just be in awe over the scenery or golf course, he'll also be in awe over you. Did we also mention the meeting space? They host multiple corporate events each year! This Denver event venue showcases true European architecture. 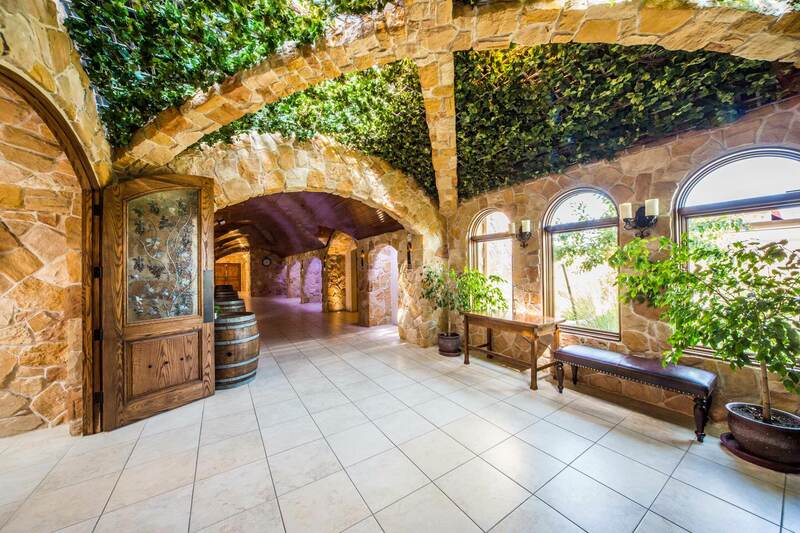 They feature flagstone stonework, french doors, pillars, wood barrelled corridors, and dare I say... a garden ceiling. You can host your ceremony on a lake, where your guests sit under a pergola. Inside, the main ballroom is 5,500 sq ft and has built in LED lights, perfect for setting the mood of the night. The rockway arches open the space so guests can also be entertained throughout the venue. They even offer French cuisine, AND offer tastings. 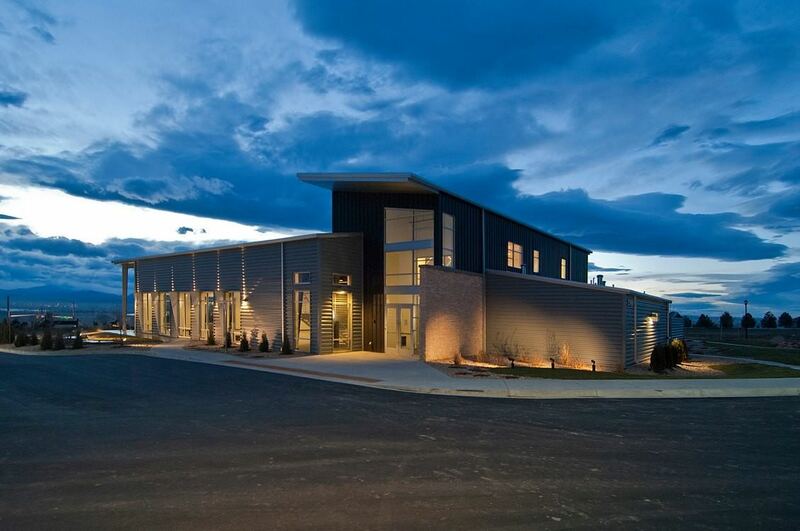 Just 18 miles West of Downtown Denver, this venue sits in the most convenient location. The Pines sits on 3 acres of wooded land, overlooking Downtown Denver. With 12,000 sq/ft on two levels and an outdoor patio area with scenic views, the Pines accommodates up to 300 guests. Two of the ceremony sites are: Aspen Wedding Terrace and Evergreen Wedding Terrace, perfect for rehearsal dinners. The Aspen showcases 2 wooden trellis sitting on golden brick pavers while the Evergreen features 2 log trellis nestled between the tallest pine trees and handmade wooden pews. If you love nature and want a view all night long, this is the spot for you. Family owned and operated, this venue sits close to Fort Collins, CO with the Northern Colorado prairies vista, it's hard to beat. It showcases modern architecture with it's black iron pillars and steel handrails. 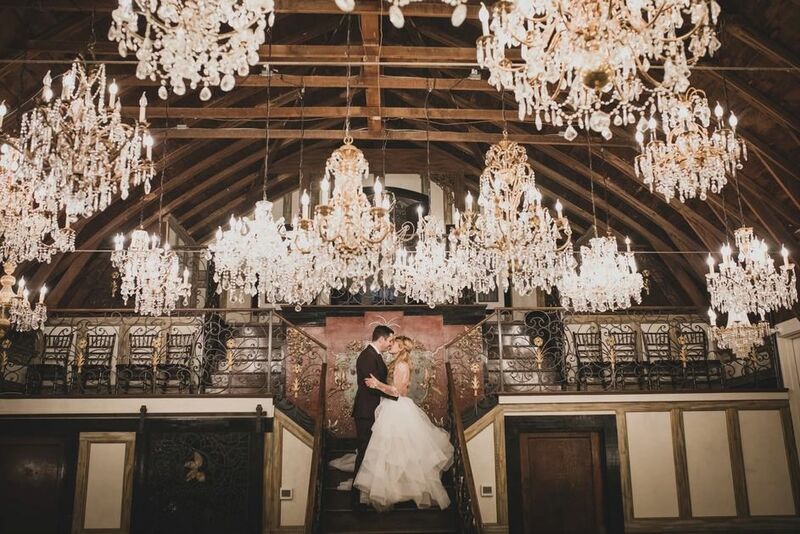 The crystal chandeliers in the ballroom are custom and only add to the elegance. You can host your ceremony outside with a view of the open land and pines directly at the head of the altar. The open prairies are a photographer's dream! We hope this gives you an idea of what you're looking for, even if you weren't sure before reading this blog. These state of the art venues all have 1 thing in common: they genuinely care about their brides and that's what's most important to us in the Wedding Industry. If you're also in need of a DJ, feel free to get a quote here.Connect with us on Facebook and Instagram to find quick information and insights on our wedding DJ services.